School for Thursday was cancelled the night before based on the weather forecast of heavy, wet snow and wind gusts of potentially 70 mph. However, the predicted snowfIall of up to a foot for the upper Cape (Falmouth, Bourne, Mashpee, Sandwich and parts of Barnstable) was right on the line. The snow/rain/sleet line that had already moved considerably in the last 24 hours from just south of Boston to our neck of the woods. On Wednesday morning, the weather people were predicting all rain for the Cape and Islands, anything north of Plymouth county would be walloped with snow, now they were changing their predictions about every five minutes and I swear one of them said, "Boston may get anywhere from 8 to 12 inches and as for Cape Cod, we really don't know at this time." Considering the wavering snow lines and clearly defeated weather channel personnel, I decided to consult my own personal weather guru. I texted Val. "We are right on the storm line. "Wiggle" is the watchword." she texted. Great. Even my oracle was at a loss when it came to predicting this storm. Meanwhile, all the news stations and the Weather Channel continued to throw out phrases and words such as "Blizzard of 2018" and "bombogenesis". Winter storm "Grayson" was looking like quite a nuisance and potentially dangerous. Of course, with these types of forecasts, the supermarket shelves looked like Armageddon. Not a loaf of bread to be found and gallons of milk were at a premium. People scrambled to gas up their cars and numerous additional tanks. Generators were tested and retested and tested, again. As for my part, considering I keep an additional refrigerator well stocked and numerous pantry items on hand including instant coffee for when the power goes out (I can still light my gas stove to heat up the water.) and my car's gas tank was already full from my weekly fill-up, I was not in as much of a panic as the rest of the town of Falmouth. Oh, I was full of dread, anticipating downed wires from the high winds, but that was about it. I did make my way through the grocery store but only for some extra eggs, bacon, maple syrup and a big, sturdy loaf of day old bread. I was armed and ready. I woke up early on Thursday and immediately pulled the curtains to look out the window. Nothing. But I know better. In an instant, the winds can pick up, roads can turn to ice and a light rain can become a white out of snow and fog. As the day progressed, the rain fell. The wind did howl and the lights flickered enough to make me flinch. Everytime the kids said, "Mom, the lights just blinked! ", I hushed them as if not mentioning it would make the power stay on. I finally managed to keep those kids quiet with French toast smothered in maple syrup and creamy, vanilla bourbon sauce. 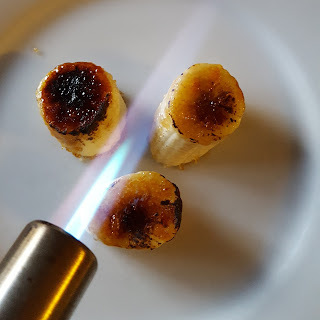 Although I am the only one who ate the carmelized bananas, they were intrigued by my use of the kitchen torch. We stayed in our p.j's for most of the day and watched recordings of our favorite shows. And as for "Grayson", she reaked havoc with coastal flooding and farther north, brought down heavy snowfall. But I would like to let the weatherpeople know that I think that using a term like "bombogenesis" may have been a tad too dramatic to describe a little winter Nor'easter on Cape Cod. Perhaps they will consult me next time when they really don't have a clue about the weather on the Cape. Combine eggs, 1 1/4 cups milk, cinnamon, nutmeg and brown sugar. Heat a griddle on medium high. Dunk and submerge slices of bread on both sides to absorb egg mixture. Use butter or cooking spray to grease griddle. Place egged bread slices on griddle and allow to cook until lightly browned on one side, about 3 minutes. Flip slices and brown on the other side. Remove browned slices of French toast onto a cookie sheet and place in warmed oven. Repeat process until all bread has been dipped and browned. 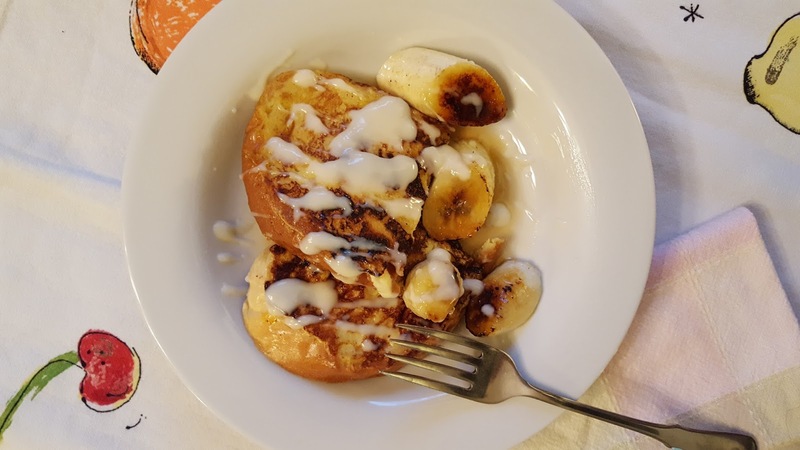 Keep French toast warm in oven while preparing vanilla bourbon sauce. Melt the butter in a small sauce pan over medium heat. Add the flour and stir to combine. Allow to cook and become light tan in color for about 2-3 minutes. Warm the milk in a micorowave for 30 seconds. Slowly add to butter and flour mixture while stirring to prevent lumps from forming. Add sugar, bourbon and pinch of salt. Stir to combine and allow to simmer for 5 minutes. Remove from heat and stir in vanilla. Cool for a few minutes before serving with French Toast. Slice bananas on diagonal into 1 inch pieced. Coat top and bottom with sugar. Melt with a kitchen torch until sugar is browned and creates a hard shell. Alternately, place sugared banana slices on a cookie sheet and broil for 3-4 minutes until browned. Serve with French Toast, Vanilla Bourbon Sauce and maple syrup. Thanks so much for your kind words! Glad you liked this one!